This is the second instalment of Tim F’s report on TWE blog’s recent Karuizawa & Chichibu whisky trip to Japan. You can read part 1 here. The following morning, refreshed after a sound night’s sleep but still occasionally feeling the lingering effects of the previous day’s jetlag, the party assembled and set off for Chichibu via minibus. It was a fairly warm, mild day with plenty of sunshine and the journey took a couple of hours, with Tokyo’s famously startling architectural juxtapositions jumping in on both sides as the dual carriageway wove us north of the city. Sleek, shimmering office and apartment buildings jostled for space alongside brutalist towerblocks and functional industrial works, though as we moved further into the city’s hinterland the latter took precedence, with large swathes of flat wasteland interspersed with factories and the occasional incongruously pretty residential development or patch of greenery. They have scenery in Japan. Gradually the scenery changed, with the flat landscape becoming bumpier and small settlements appearing – again with a mix of stark modern urbanism and postcard-pretty traditional dwellings – as we slowly approached a range of mountains that had sprung up in the distance to the northwest. After stopping by the side of the motorway for impressively massive tempura and noodles in what seemed to be the Japanese equivalent of a superior Little Chef, in the early afternoon we arrived in the Chichibu area, surrounded on all sides by beautiful hillside. It could have been Scotland if it hadn’t been so warm. Our first stop before touring the distillery itself, though, was to one of owner Ichiro Akuto’s recently-constructed warehouses, where he had agreed at short notice (more on this in a later post) to house the fabled last stocks of Karuizawa whisky acquired by Number One Drinks in August last year. A word on Akuto-san himself. 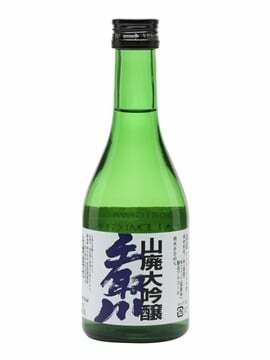 The scion of a family who have been making sake in the Chichibu area for around 400 years, Ichiro Akuto joined the family business in the 1990s after a spell as a marketing manager for imported liquors with Japanese drinks giant Suntory. Unfortunately, when he got there the Hanyu distillery established by his grandfather, which had switched to single malt production in the early 1980s, was in the final throes of going out of business, with the distillery forced to close in 2000 and the company’s assets, including Hanyu, being dismantled and sold a few years later. 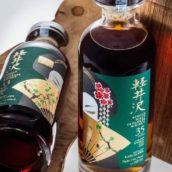 Akuto-san, who was president of the company by then, managed to save a few hundred casks of maturing Hanyu during the break-up of the site, thanks to the help of another old sake company, Sasanokawa Shuzou. 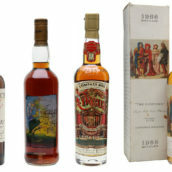 This rescue was to prove absolutely crucial, as Akuto-san was able to use the skills he’d picked up at Suntory to market these excellent and almost unknown whiskies. 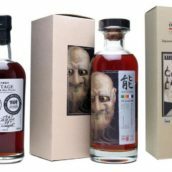 He introduced the Ichiro’s Malt Card Series, bottling exceptional single casks of Hanyu with innovative labels, and the revenue he raised helped him to fulfil his dream of setting up a new distillery in the Chichibu area, just 25 or so miles from the original Hanyu site. 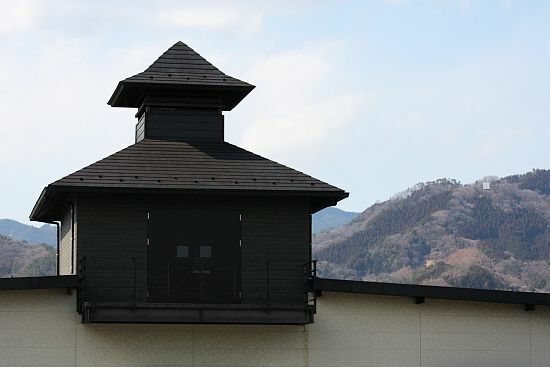 Distillation began on the site of the new Chichibu in 2008. Back to the present day at the warehouse containing the Karuizawa whisky casks, and the excitement as we stepped off the bus in a deserted modern industrial park was palpable. We’d picked up Akuto-san outside the distillery on the way, and he seemed to remain the only calm presence as we disembarked and waited eagerly for access to the warehouse. Marcin got a bit giddy and was skipping about like an enormous follicly-challenged teddy bear, even insisting on posing for photos next to the large pile of recently-unloaded Karuizawa-stamped wooden pallets running down the side of the warehouse. We indulged his exuberance – we all had some butterflies. 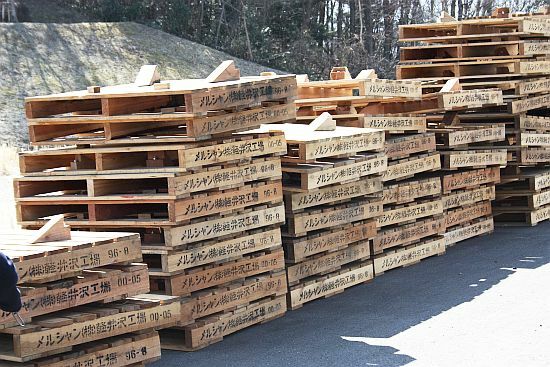 Some pallets. Please try and contain your excitement. Inside the darkened warehouse, a more reverent hush descended, punctuated by excited stage whisperings as we scurried around the casks. Although we felt like archaeologists exploring a newly-opened tomb, the atmosphere was more cathedric than sepulchral. We did our best not to be disrespectful to the peace of these last liquid remnants of an extinct distillery. 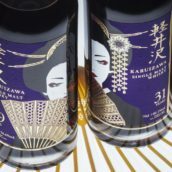 It wasn’t a particularly big warehouse, and it quickly became obvious that the world’s last supplies of Karuizawa single malt took up less than half of it, with one whole side consisting of casks from Chichibu, pallets of packing material, a smattering of retired casks and empty space. Many of the Chichibu casks on our left were brand new, the oak almost unnaturally clean, pristine hoops gleaming in the gloom. Doing a few quick sums in my head, it seemed that there were only around a couple of hundred casks of Karuizawa whisky here. Was this really all that was left? Yes and no. David explained that a significant proportion of the few hundred casks that had been purchased from Mercian / Kirin were relatively young, having been filled in the 1990s. 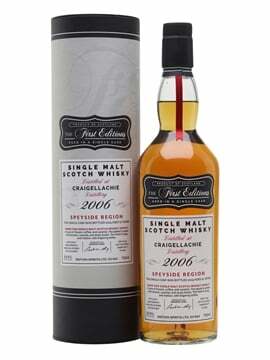 A good number of these casks (to be precise: 77, which is a very good number in anyone’s book) from the 1999 and 2000 vintages have been vatted together to create an 11 year old Karuizawa single malt that will be the first large batch young Karuizawa whisky to be released in Europe. This batch has yet to be bottled, but is provisionally entitled Asama, in reference to the beautiful snow-capped volcano that overlooks the distillery, and should be hitting the shelves in the next few months. All the remaining casks were here in the warehouse, and will be split between the company’s distribution partners, namely TWE and our French friends for Europe and America, and Eric for the Far East, over the years to come. 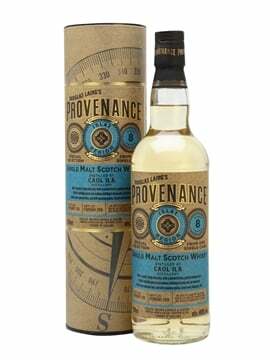 It was both awe-inspiring and heart-breaking to gaze across such a small number of casks and realise that this was all that remained of the output of a distillery that produced single malt whisky for nearly fifty years. We eventually wrenched ourselves away from the warehouse and were ferried back to Chichibu for a look around. Akuto-san led us to a warehouse close to the distillery office, where we were asked to change into hygienic flip-flops. The Chichibu distillery. All of it. Looking up to be confronted with a bunch of small but very beautiful wooden washbacks, it became suddenly clear that this warehouse was in fact, the Chichibu distillery. It is a minor masterpiece of scale design – everything is perfectly miniaturised – and efficient use of space. Akuto-san’s fortitude in the face of disaster and his determination to make his dream real are as inspiring as the quiet pride and happiness that radiated from him as we pottered excitedly around his distillery. We first inspected the remains of a small pallet of imported sacks of barley, which Akuto-san explained was brought in from England, Scotland and Germany, although they had very recently begun using some barley from local farmers as well, and hope to use more and more of this local barley as time goes on. 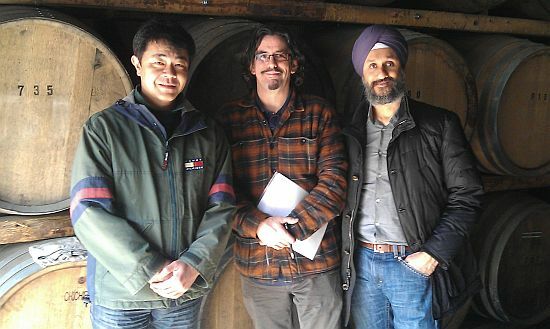 Akuto-san has paid several visits England since the distillery opened in order to learn how to do the malting himself. 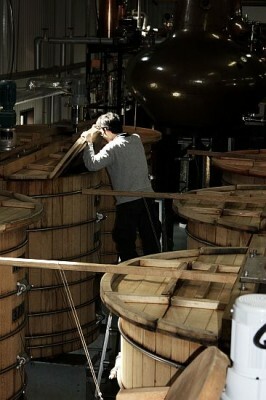 It’s clear that Akuto-san has a fervent desire for Chichibu distillery to be as self-sufficient as possible – he has even recruited a local cooper in his 80s to teach the art of coopering to his staff so that they can build their own barrels, and he also has plans to use Japanese peat from elsewhere in Saitama prefecture to malt some of his barley. This kind of dedication to detail, this commitment to doing everything in the right way and to the regionality of his operation can only be of great benefit to Akuto-san and Chichibu in the future, as it ensures that his whisky will have its own inimitable style, inextricably linked not just to the individual processes and equipment used at the distillery, but also to the terroir of the local area itself. We walked up a few stairs from the milling room to check out the mash tun, which is on an open platform about eight feet up, overlooking the washbacks we passed on our way in. At just 2400 litres, the steel mash tun was the smallest I’d ever seen. I’ve read elsewhere that Akuto-san sourced it from a local brewery. In any case, there’s no kind of lauter inside, so the mash must be stirred by hand with an evidently homemade tool that faintly resembles an out-sized table-tennis bat on the end of a broomhandle. Stirring is made easier by the fact that the tun is only about five feet deep, is positioned waist-high on the platform and measures about a metre across. We lingered on the platform, taking in the eight beautiful Mizunara wood washbacks. Encased in steel hoops, at around eight feet high (including the large girders on which they perch) these are not much bigger than the mash tun – though they are a bit broader – and hold just 3000 litres of wash each. The natural light streaming in from small windows in the side of the distillery building illuminates the washbacks in an aesthetically pleasing way that I tried and failed to catch on camera. On another raised platform at the far end of the distillery sat a pair of the dinkiest stills I’d ever seen. Made by Forsyth’s of Rothes, the wash still resembles a trodden-upon onion, with a proportionally very wide circumference, a short, fat neck and a very gently descending lyne arm. There doesn’t seem much opportunity for reflux here, and Akuto-san has confirmed elsewhere that everything is designed for as rich and heavy a spirit as possible. The spirit still is rather daintier, almost red-apple-shaped with a sharply tapering, higher-shouldered base and a slightly longer, taller neck. 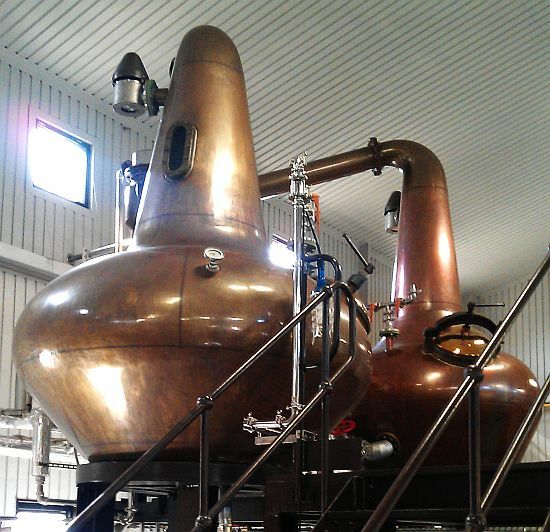 Both stills have a capacity of just 2000 litres and are fitted with shell and tube condensers. The stills. They are dinky. Kawaiiiii!! 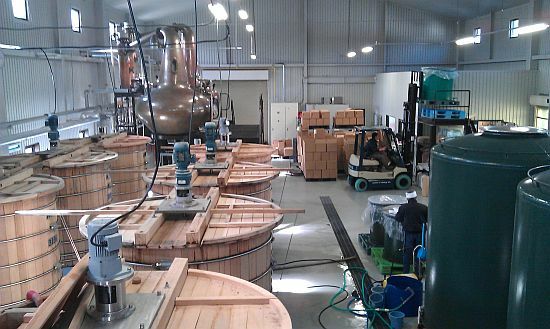 The spirit from the stills is run to a group of large spirit receivers before bottling. 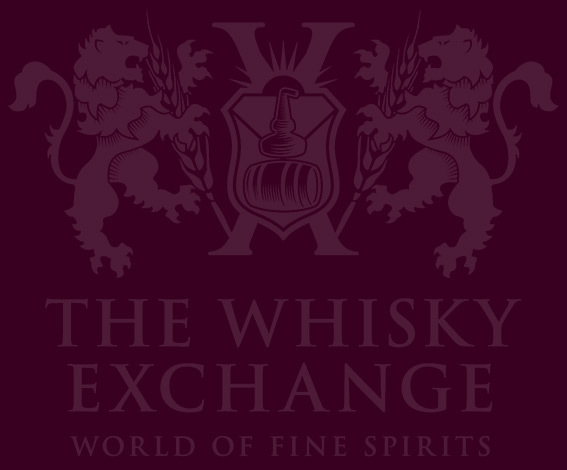 Each batch of distillate yields just over 200 litres of spirit. 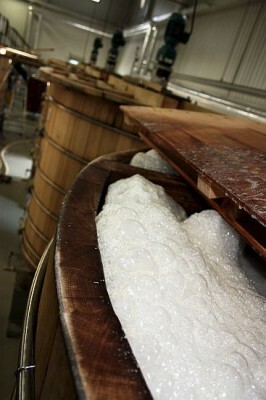 Even at full capacity, Chichibu can only make around 80,000 litres a year, enough to fill around 400 casks. At present, Akuto-san is experimenting with all kinds of wood to discover what works for his spirit. That sounds complicated, but with so few casks produced in Chichibu’s short history thus far, keeping an eye on everything that’s going on in the warehouse isn’t as difficult as it would be at other larger or longer-established distilleries. 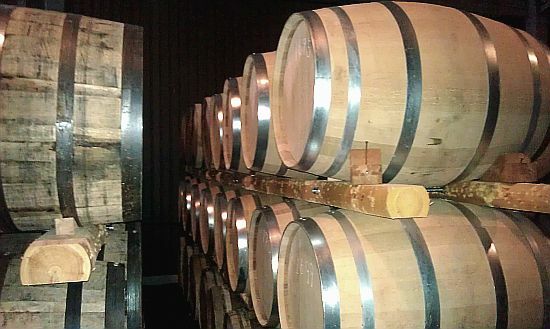 The casks used so far include port, sherry, Cognac, bourbon, Bordeaux, mizunara and quarter casks called ‘chibidaru’ or ‘cute’ casks. We saw all of these in the warehouse we visited as the final part of the tour, but this time we didn’t linger quite so long. It was well into the afternoon by now, and there was whisky to be tasted.